Equipment is delivered as a kit pre-cut, pre-drilled, labeled with all necessary hardware. If community volunteers are involved, our average size play structures may be built over a one or two-day period with the help of our on-site construction supervisor guiding the installation. 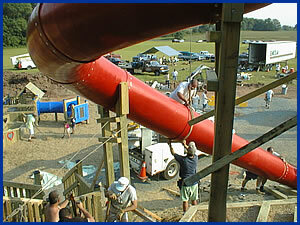 The manufacturer’s product liability coverage and warranty is effective regardless of who installs the playstructures. For more information continue reading or click on the links below to download, view and/or print the PDF files. The role of your play consultant is to provide unsurpassed attention to your project. Just a phone call, e-mail, or fax away from you, we are here to guide you in a responsible and friendly way. Prior to equipment shipment, your play consultant and installation supervisor will provide your designated team leader with verbal and/or written information about the installation issues and team organization. The play consultant will provide scaled, dimensional, computer-generated drawings of the structures with safety zones in accordance with the manufacturer’s recommendations as well as ASTM (American Society for Testing and Materials 1487). The play consultant will specify type and amount of resilient surfacing required within safety zone of proposed equipment. Additionally, specification of perimeter treatment will be addressed by play consultant. The play consultant will provide a tools list specific to the scope of your project indicating the type and amount of tools required. The supervisor will instruct volunteers on the proper interpretation of drawings and sequence of installation. The supervisor will instruct volunteers on the proper installation of perimeter treatment and resilient surface installation simultaneous to equipment installation. If concrete is required, the play consultant will advise of the quantity, strength (3,000 psi), and best method of mixing. The supervisor will advise of concrete delivery schedule based on progress of installation. The supervisor will provide a punch-list of incomplete items if installation extends beyond contracted period. Supervisor may be contracted for extended installation, if required. The supervisor assumes no liability for personal injury or loss as a result of the construction and ongoing use of any and all play equipment located on your site. The volunteer group is responsible for arranging and scheduling all volunteers, cement supplier, rental equipment (if required), lunch and comfort provisions for group. The volunteer group is responsible for procuring resilient surfacing and perimeter treatment if these are not purchased with equipment from play consultant. The volunteer group is responsible for supplying all equipment and tools other than that supplied by the playground manufacturer. (Refer to tools list provided by play consultant). The volunteer group is responsible for the safe storage of all equipment and for site security during the project (i.e. fencing, caution tape, and patrol, as required). Bear in mind the equipment is susceptible to damage and loss with each relocation. Leaving it on site is strongly recommended. The volunteer group is responsible for all insurance coverage for property, injury, liability, etc. during the installation. 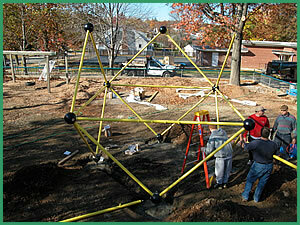 The volunteer group must bring any problems related to the playstructure installation to the attention of the supervisor. No onsite modifications are to be carried out without the consent of the supervisor. 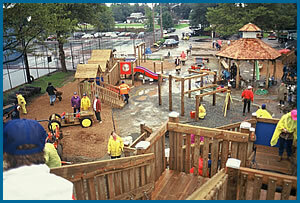 Any modifications made to the playstructure without consent of the supervisor are the group’s responsibility to ensure repair to a satisfactory level in accordance with manufacturer’s recommendations, CPSC, and ASTM. The volunteer group is responsible for taking down and removing all temporary bracing and site cleanup. The volunteer group is responsible for the completion of the installation of equipment, resilient surfacing, and perimeter treatment. The volunteer group is responsible for setting up a routine maintenance schedule with play consultant or other knowledgeable agency. The volunteer group is responsible for equipment payment in accordance with terms presented by play consultant (40% deposit with order, balance less supervision fee payable at time of delivery. Supervision fees are payable directly to supervisor at completion of service). The volunteer group is responsible for the wonderful result of this collaborative effort. We will work together to build a lasting environment that will help to develop healthy children, facilitate more sharing time between parents and children, and add a cohesive and empowering quality to your community. Work safely, work hard, feel proud, play hard. Establish an installation weekend convenient with your volunteer group and reserve an installation supervisor through your play consultant. Please make reservations early -- the spring and fall schedule fills quickly. Place your order with Designed for Fun, Inc. six to eight weeks prior to desired installation date. 40% of the equipment cost is requested with your order payable to Designed for Fun, Inc. (Balance plus freight will be due upon receipt of materials). An acknowledgment of your order is sent within ten days of receiving your order. Please check that the shipping address and equipment specified is accurate. Installation instructions are shipped with the materials. Five days prior to installation date, the equipment is loaded and begins its route to you. Equipment is usually delivered in brokered or common carrier trucks. The shipper is instructed to call your designated contact 24 hours prior to delivery. One to two days prior to installation, have a team of volunteers on call to meet the delivery truck and unload. The equipment may be unloaded by hand or with a forklift. Discuss with your play consultant which way is appropriate for your order. Number of volunteers required varies according to size of project (2 to 3 for equipment value under $15,000; 3-5 for equipment value of $25,000; 5-10 for equipment value of $50,000+). Off-loading the truck will take approximately 1-1/2 to 2 hours of their time. The equipment should be laid as close to the build site as possible but not where the holes will be dug. One to two days prior to installation, the layout and staking of the equipment should be done either by the hired installation supervisor or another qualified individual. This is a crucial aspect of the project. If the holes are drilled improperly, volunteers will have to fill and dig by hand wasting time and during the installation process. After the layout is prepared, you may bring an auger on site to drill the holes. We recommend an 18” auger or 16” minimum. The soil excavated from the holes should be shoveled up and transported away from the work area but still on site. We will use about 10 % of the excavated soil to tamp back into the holes later on top of the concrete. A crew of 2 or 3 with shovels and wheelbarrows should be sufficient for this task. Section off the area with exposed holes (i.e. caution tape, snow fence). 7:00 a.m. Set up a welcome table with sign-up sheet, name tags, cotton gloves for those who think they won’t need them, and masking tape with markers to label volunteers’ tools in case they have not done this. Adolescents 14 years of age and older are permitted on the work site as an assistant to an adult volunteer. Youngsters are not permitted on the work site until the installation supervisor determines it safe for them. A refreshment table should be set up early. It is the responsibility of the volunteer group to keep drinking water flowing to workers and to provide a comfort station. One or two individuals should maintain the play equipment inventory. Each component of your structure is labeled with a part number that corresponds to the installation drawings. Hardware is packaged in labeled plastic bags and burlap sacks. Monitor the outgoing components and hardware to be sure the volunteer matches the correct parts to the task at hand. The installation booklet specifies which pieces are required for any particular assembly. Onsite construction begins with your installation supervisor and 10-15 volunteers as the first platform and columns are put into place and temporarily braced. Refer to tools list for type and quantity of temporary brace materials. 8:00 a.m. Remainder of volunteers arrive and begin to assemble components and attach them to structure following the guidance of the supervisor. How many volunteers do we need? Our general rule is 1 person per $1,000 of the equipment/surfacing/perimeter cost. Note: The installation supervisor is not responsible for building your structure. It is not likely the group will finish on schedule if we are short 25% of the recommended number of volunteers. 1:00 p.m. (or as soon as finished eating lunch) Resume installation process. Installation supervisor will evaluate when to have concrete delivered or mixed (no earlier then 3:00 PM on the first day) The structure is built and braced before the concrete is poured. The supervisor will instruct how to shape the concrete and fill the tops of the holes with the excavated soil. The completion time will vary depending on size and complexity of structure. 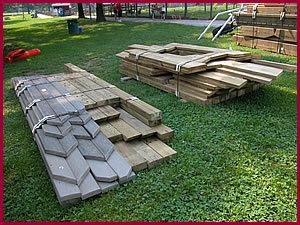 Your play consultant and installation supervisor will prepare you to schedule either a one or two-day installation. Equipment valued at $15,000 and under is almost always completely erected with surfacing and perimeter in one day. Simultaneous to the installation of the equipment, the supervisor will coordinate a group of volunteers to do the layout and installation of perimeter treatment and resilient surfacing. This segment should always be done after the holes are prepared and the structure erection is well under way. The installation supervisor will either be hired for the next day or will provide a punch list of completion items if the installation is incomplete. 5:30 p.m. Begin closing the site, retrieving all tools. Secure structure if construction will continue the next day. Finish-Up Work Remove bracing and discard. Installation supervisor or volunteer team leaders should inspect the structure to ensure it is installed per the manufacturer’s recommendations. If the supervisor is not hired for the second day, he will inspect the structure before leaving and provide a punch list of completion items that, once complete, will ensure a correct installation. The Community Built Association (CBA) is a not-for-profit association of professionals who are involved in all aspects of the community built field. The offers information, education and training to the general public. You can visit the CBA website at www.communitybuilt.org.